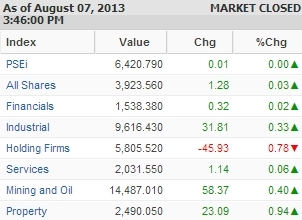 Manila—(PHStocks)—Philippine stocks ended flat Wednesday, 7 August, amid thin trading ahead of the holiday. The Philippine Stock Exchange (PSE) index was at 6,420.79 – ticking up by just 0.01 point as investors continued to stay in the sidelines. On a sectoral basis, however, most counters recovered, led by the Property segment, which increased by 0.94%. The Mining and Oil index edged higher by 0.4%, while the Industrials went up by 0.33%. Trading was slow, with value turnover reaching just PhP4.947 billion on 2.55 billion shares traded. Foreign buying totalled PhP2.49 billion while foreign selling was PhP3.27 billion. There were 69 gainers compared to 49 losers, while 51 stocks were unchanged. Today’s top most active stocks were SM Investments Corporation (SM, PhP846.00, -1.51%), Ayala Land Inc. (ALI, PhP29.05, +0.69%), Alliance Global Group Inc. (AGI, PhP26.00, NC), SM Prime Holdings Inc. (SMPH, PhP16.78, +2.07%), Universal Robina Corporation (URC, PhP119.60, -0.33%), Metropolitan Bank & Trust Company (MBT, PhP106.50, +0.57%), Philippine Long Distance Telephone Co. (TEL, PhP3,084.00, +0.13%), Manila Electric Company (MER, PhP281.40, +1.96%), Metro Pacific Investments Corporation (MPI, PhP5.00, NC), and Security Bank Corporation (SECB, PhP141.90, +0.14%).